clauds was awarded the Basic Barnstar by warren for their work in this research note. 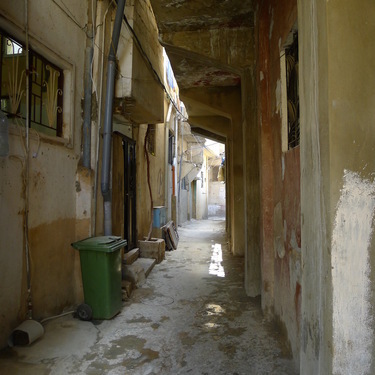 Bourj Al Shamali is located 3 km east of Tyre in south Lebanon and has approximately 22,000 registered Palestinian refugees. 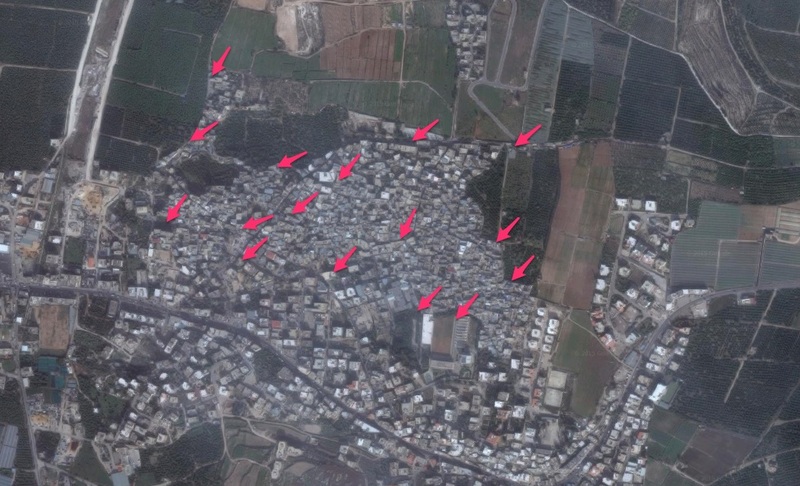 Obtaining a map of the camp seems like an impossible task, and as it is a small compact space, the current aerial images (on google) are not of high enough resolution to distinguish the narrow streets and individual buildings. 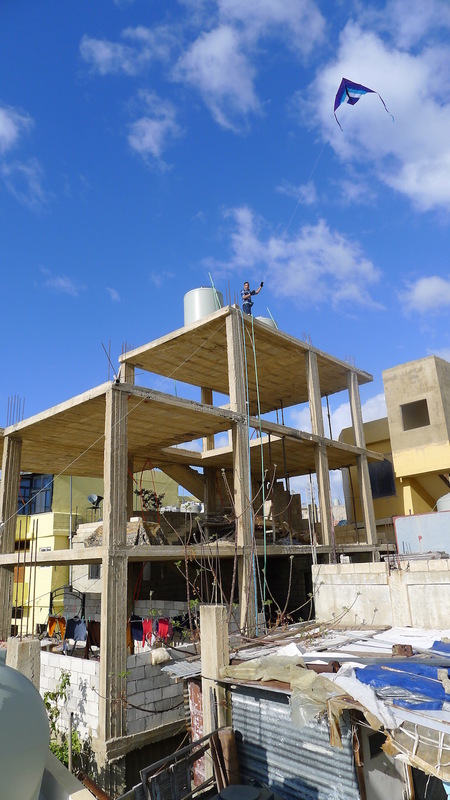 For this reason with Al Houla Association in the camp, we launched a kite and balloon mapping initiative in May 2015. The aim of this aerial map was to have a tool that would help the local committee in the camp to do two things: (i) to launch an urban agriculture pilot project; and (ii) to create a green space in the camp. As Bourj Al Shamali is such a compact space, we took images at various altitudes to ensure we had high quality images of rooftops, but also good overviews of the camp. The aim was to get close to the ground photos for small, precise images and higher up images with greater range but lower resolution to help us piece together the map. On average we took photos at 80-100 and then at 200-250 meters altitude. We measured this by marking our line with the different altitudes we needed. 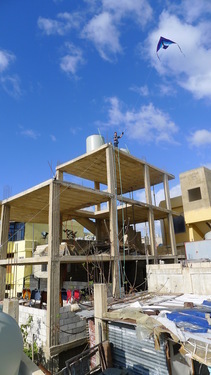 Our main equipment issue was acquiring helium in Lebanon. Helium is expensive, although it was relatively easily available. In addition, logistical challenges stemmed from the physical aspects of the camp. In an ideal setting, one can cover large areas if you are able to walk around with the balloon and there are no obstacles. In Bourj Al Shamali, however, streets are narrow and therefore difficult to maneuverer in with the balloon. 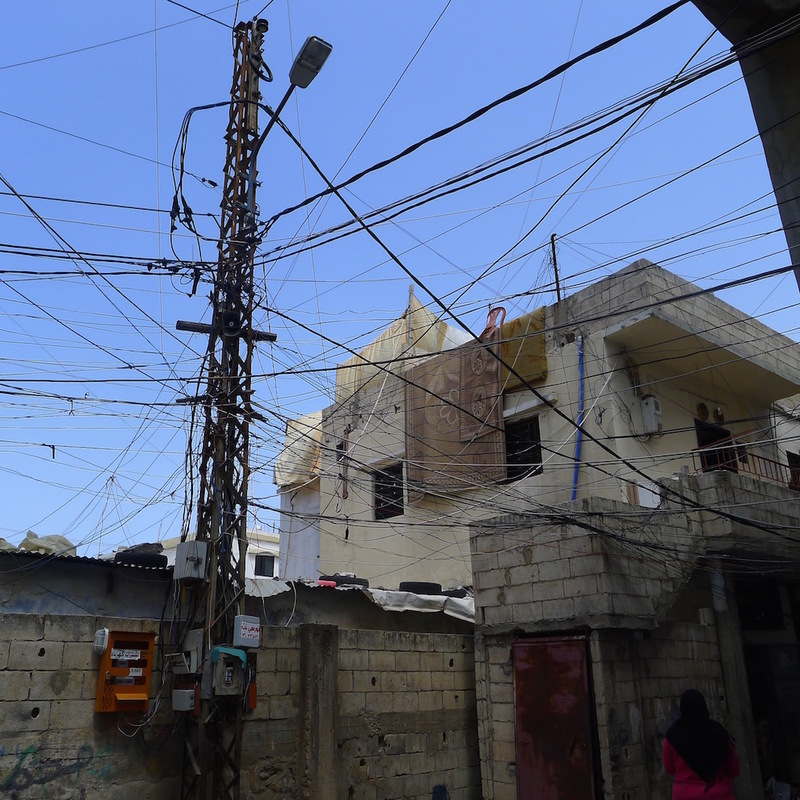 There is also a maze of electricity cables above all streets and around the buildings. The camp is on a hill and with the sea close by, the area is also often windy, with the wind going inland. At some of the most strategic locations this meant that the wind worked against us, making it difficult to steer the balloon where we wanted to. We compensated for our inability to walk around by launching our balloon from many different locations. In total we mapped from 16 different positions within the camp, covering the whole area. To solve our problems we also had a lot of community support: the wind meant that twice the kite broke and we needed help from a seamstress in the camp to help us fix it. We also received help from a local carpenter who constructed a case to protect our camera, and from the school physics teacher who helped with ideas. When the balloon was shot down, the local tyre shop helped to patch up the holes. In addition, we were also invited to roof tops and people's homes constantly, as people wanted to partake in the project. I'm really interested that you were able to patch one of the balloons locally. I'd be fascinated to see the patch. I am a little confused as to when you used a kite and when you used the balloon. What sort of kite did you use? Could you provide a picture of the camera mounted in the "case to protect our camera"? I am with @mathew about the patch. What is the balloon made of? We have been using weather balloons that rip to shreds when they burst. Thanks Liz, Mathew and Dan for your comments. @Liz, we feel we have a lot of photos and are putting them together. We are doing it offline on photoshop, due to sensitivities of having the info online (for the time being). 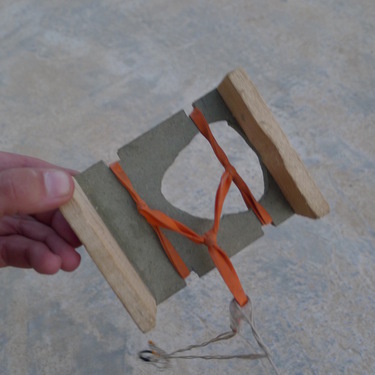 @Danbeavers, the kite we used was from Public Lab's kit. We started with a kite, but it was very hard to control from the rooftops - @firas and @mustafa10 climbed all over people's roofs when we did so! The balloon was also the one sold by Public Lab. It was shot with a pellet gun, and so a small hole was made when the balloon was in mid air. It did not burst, but you could tell in mid air that something was going wrong. This meant we had to bring it down fast and patch it. In this photo, you can see us trying to avoid the new construction in the camp! This photo is awesome. What a team! @Mathew and @Danbeavers : Here is our balloon on its last legs. 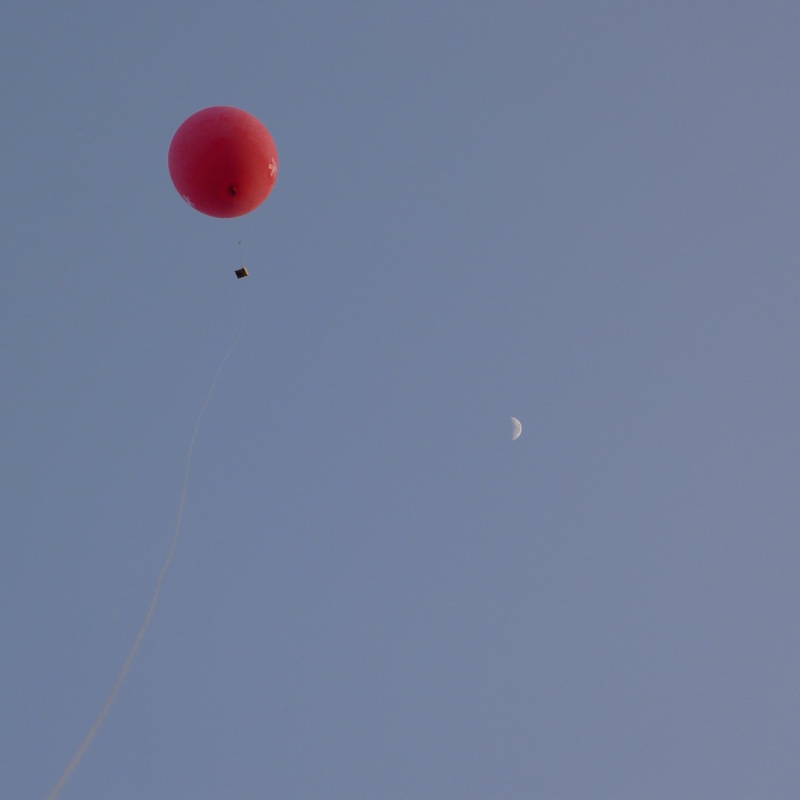 This is the best photo I could find of the balloon with the two patches (the pellet went straight through it), but by this point the balloon had lost a lot of the helium. Also the camera case in action, after many attempts with bottles and different fins. Hope this helps explain how we tried to solve the problems we had! I agree with @kile and I am amazed that you could patch the balloon and then inflate it with the patches still holding. Thanks @klie and @danbeavers for your feedback and appreciation. A few clarifications that as I re-read the research note I realise are not clear: (i) We used more than one ballon, the truth is 2 were shot down and one burst when it got caught on a nail in a narrow alley (and that taught us that these balloons do burst!) but when they were shot at, we were able to patch them up and keep going for the day. After that we were unable to reuse them. The tyre shop tried to see if something could be figured out that would be more long-lasting using the balloon that was shot down and the remainders of the burst one, but with no luck. (ii) To get all 16 locations we actually took 2 months - we tried kites and when the first balloon was shot, we had to wait until we got a replenishment of balloons from Public Lab. 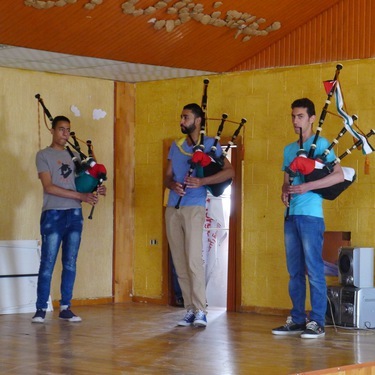 In addition, we had to do it on weekends when the team was not at school, and @Firas and @Mustafa10 who were super passionate about the mapping are also in the camp's music band (they play bagpipes) so that meant we had to juggle various things when scheduling days to map (aside from rain and wind!). Last thing that took us time was helium, it is very expensive, and Firas who is studying to be a nurse, found out about the supplier of medical gas to the local hospital and through him got cheaper helium! So I realise the note reads as if we did it all in one day, but rather it took much longer. Still, on our last day mapping we managed to do 6 locations. The rest were done getting 2-3 locations per day (on average). As we waited for the new replenishments of balloons and helium, we did go to check rooftops and places from where we could map. This meant that while it took us a long time to do the actual mapping, we ended up talking to a lot more people in the process and really getting to know the camp inside out! fact checking: @Firas and @Mustafa10 play bagpipes? Yes that is correct. There is a fabulous band in the camp. Here they are: Mustafa on the left and Firas on the right!